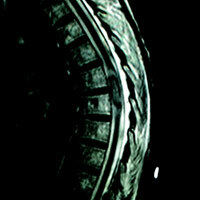 A 69-year-old woman presented with back pain and difficulty walking/gait instability. Past medical history includes hypertension and osteoarthritis. No history of cancer. MRI of the cervical spine (not shown) demonstrated multilevel degenerative changes, eg, disc ridging, facet arthropathy, etc. 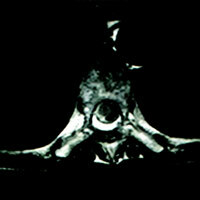 MRI of the thoracic spine revealed an avidly enhancing, “sausage-shaped” intradural extramedullary mass spanning the T6-7 level. Upon first glance of the sagittal images, it seemed plausible that this could be a T1 hypointense, heterogeneously T2 hyperintense, enhancing mass within the cord substance (ie, intramedullary). However, upon careful review of the axial images, its precise location (within the thecal sac, just right of midline, compressing the cord) was clear. Slight cord edema was noted upon sagittal T2 and STIR (short T1 inversion recovery). This lesion did not appear to be dural based, eg, no dural attachment or evidence of an enhancing dural tail. Intradural extramedullary schwannoma, neurofibroma, meningioma, myxopapillary ependymoma, metastasis, sarcoid. The pertinent differential for an intradural extramedullary (solid) mass has been listed above. Other entities exist but are less common. Based on key anatomic and imaging features, one could presume the lesion is an intraspinal schwannoma. 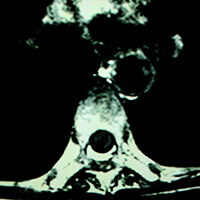 Statistically, schwannomas are the most common intradural extramedullary mass. The vast majority is intradural, but a small percentage is extradural. They may be “dumbbell-shaped” when foraminal, but large, oblong purely intraspinal lesions spanning two or more vertebral levels are often reported. Histologically, they are World Health Organization grade I lesions; though most spinal schwannomas occur sporadically, there is a strong association with neurofibromatosis (NF)-2. Clinically, patients present with back pain, weakness, and/or paresthesias. Most lesions are amenable to gross total resection. Most spinal meningiomas are intradural, slow growing, demonstrate avid enhancement, and have a dural tail. Some lesions may not manifest with a dural tail, per se, but a dural-based appearance is evident upon multiplanar evaluation. A localized neurofibroma may appear similar to a schwannoma. Conversely, diffuse or plexiform lesions appear quite different than what is seen in this case. Plexiform neurofibromas are pathognomonic for NF-1. Myxopapillary ependymomas are usually seen within, or near, the conus medullaris. Heterogenous T1/T1 signal may reflect intralesional hemorrhage. A nonneoplastic consideration that always warrants consideration is sarcoid. When involving the spinal canal, mass lesions from sarcoid are usually intramedullary and result in cord expansion, surrounding edema, and so forth. An intradural extramedullary location would not be impossible and has been reported in the literature. Neurosarcoidosis is generally seen in patients with systemic disease. Matsumoto S, Hasuo K, Uchino A, et al. MRI of intradural-extramedullary spinal neurinomas and meningiomas. 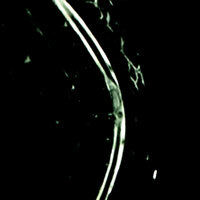 Clin Imaging. 1993;17(1):46-52. Demachi H, Takashima T, Kadoya M, et al. 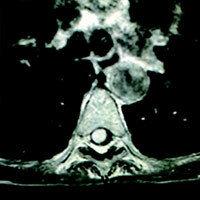 MR imaging of spinal neurinomas with pathological correlation. J Comput Assist Tomogr. 1990;14(2):250-254. 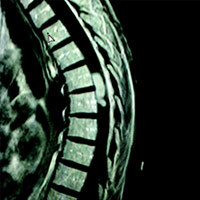 Submit cases via e-mail to Rahul V. Pawar, MD, at rvp325@gmail.com or to Radiology Today at david.yeager@gvpub.com.